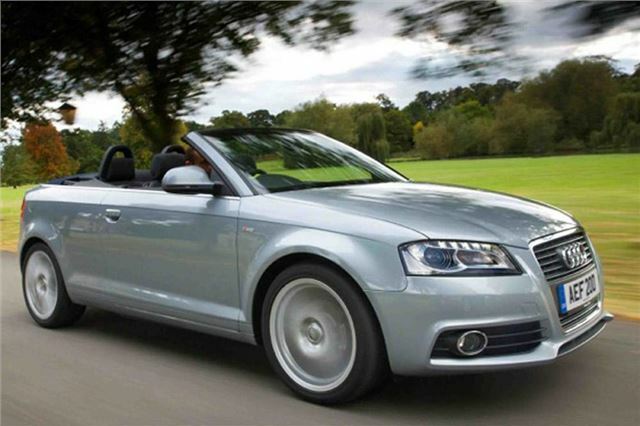 2008-2013 Audi A3 Cabriolet reached its 'Final Edition' at prices from £23,775 OTR to £30,615 OTR and various attractive enhancements. The Audi A3 Cabriolet Sport Final Edition replaces cloth upholstery with supple Vienna leather. It also adds front seat heating, rear parking sensors, automatic headlight and wiper activation, cruise control and a Bluetooth mobile phone interface. These are in addition to existing Sport trimmings such as 17-inch alloy wheels, sports suspension, dual-zone climate control, a Concert CD audio system with auxiliary iPod/MP3 socket and a fast-acting fully automatic acoustic hood. Audi A3 Cabriolet S line Final Edition models replace original 18-inch S line alloy wheel with a new five-segment spoke design, add full Vienna leather upholstery in place of the original fabric and leather combination, and also include xenon plus headlights with LED daytime running lamps, DVD-based satellite-navigation, Audi Music Interface iPod connection and a BOSE sound system. Power options for standard Cabriolet models, and both Final Edition variants, include three turbo charged and directly injected petrol units – the 1.2 TFSI with 105PS, the 1.8 TFSI with 160PS and the 2.0 TFSI with 200PS or two turbo charged direct injection diesels – the 1.6 TDI with 105PS and the 2.0 TDI with 140PS. The 1.6 TDI offers EC economy potential of up to 65.7mpg with CO2 output of as little as 114g/km.